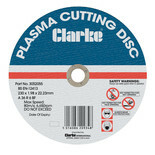 A new ultra thin metal cutting disc generating less heat and so reducing the risk of distortion particularly on thin sheet metal like car bodywork. 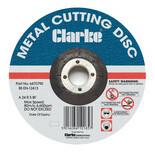 115mm (4½") diameter ferrous metal cutting disc with a 22mm diameter bore and depressed centre. 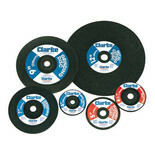 Fits most 4½" angle grinders with a standard M14 drive shaft. 230mm (9") diameter ferrous metal cutting disc with a 22mm diameter bore and flat centre. 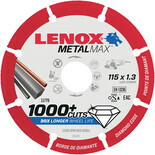 Fits most 9" angle grinders with a standard M14 drive shaft. 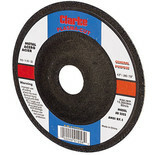 115mm (4½") diameter non-ferrous metal grinding disc with a 22mm diameter bore and depressed centre. 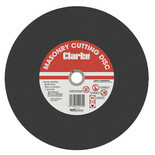 22mm diameter bore means it will fit to most 4½" angle grinders with a standard M14 drive shaft. 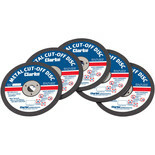 A pack of five replacement 3" metal cutting discs for use with Clarke CAT66, CAT99, CAT113 and CAT127 cut-off tools. 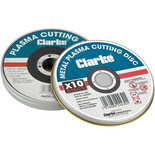 100mm (4") diameter ferrous metal cutting disc with a 16mm diameter bore and depressed centre. 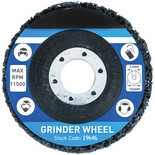 Fits most 4" angle grinders with a standard M10 drive shaft.